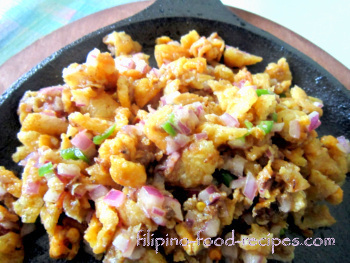 There is not one exact sisig recipe for pork, squid or any other meat. The recipe has evolved and each version is different from that of the next's. The squid sisig on this page is a play on the one my family enjoys in a Filipino restaurant up in North Jersey. The squid is fried to a crisp, chopped, seasoned and served in a sizzling platter. The hard part is basically how to make the squid crunchy. If you have a commercial kitchen with a fryer that you can control the temperature, that would have been easy. But for home cooking, I tried the technique I used in making chicharon. I dry up or dehydrate the squid in a fairly low oven temperature and deep fry in hot oil to get that nice crispy texture. 1 Clean and wash the squid a few times and cut as thin or as fine as you can, strain and pat dry. 2 Set on an oven-proof dish and bake in a 200°F; for 30 to 45 minutes to dry out. 3 Heat up the cooking oil up to 375°F; and fry for 2 - 3 minutes to become golden brown. 4 Remove from heat and lightly season with salt and pepper, then chop coarsely. 5 Mix the butter, liver spread in a saute pan and heat up for a bit. Turn the heat off. 6 Add the chopped onion, chili peppers, lime or calamansi juice, then add the crispy squid. 7 Set on a hot sizzling plate (if desired), or serve while hot. Learn how to prepare the sizzling plate here. Beware of oil splatter. Frying squid is quite dangerous because of the oil splatter so take necessary precautions. Try to get squid that is not too thick so if dries out easily and fries up nicely. Try baby octopus if available, I think it is better to use for this recipe than squid, as they are pretty thin and easily fries to a crisp. To prepare the sizzling plate, just brush with a little oil and set on a stovetop to heat up. Once it is lightly smoking, you can now add the sisig. 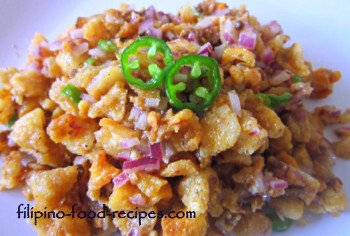 You could use this sisig recipe for other kinds of meat -- say, crispy fried pork or bagnet or crispy fried chicken with skin. As always, cooking with squid leaves the kitchen smelling funky, so try any one of the solutions for removing cooking odors here.